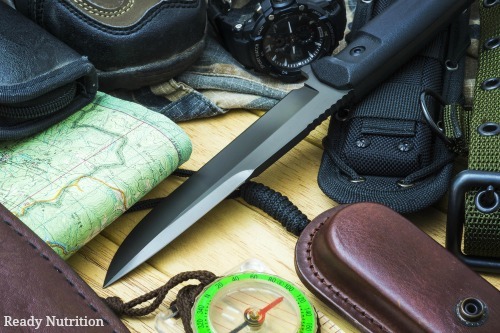 ReadyNutrition Guys and Gals, we’re going to give some info and recommendations on knives. There are about as many uses for knives  as you can imagine: knives for skinning, filleting, fighting, and all-around survival. There are a ton of different companies that manufacture knives, and not as many of them in the United States as there used to be. There is a resurgence in small forges and private knifemakers currently throughout the U.S., and in a future article, I will cover this subject in more detail. For now, we’re going to stick with the well-known firms, of which I have both preference and experience with for different reasons. My “carry” blade for defense is a Spyderco H-1 Jumpmaster model , made in Seki City, Japan. I’ve been “into” Spyderco for a good while; when I was in the service I carried a Spyderco Police model  stainless steel folder. This Jumpmaster model is actually designed by jumpmasters of the U.S. Army. The blade is sharp – beyond belief and can be sharpened on a Tri-Angle Sharpmaker , also made by Spyderco. As far as a good general purpose survival knife is concerned, I really love what Gerber puts out (or rather, the older models), with the Gerber BMF series being really great. As far as newer models run, I have a Gerber Mark 11 , a two-edged blade similar to the Fairbairn-Sykes Commando model used by the OSS in World War II. The knife was made in the U.S., and the sheath was made in China. Guess we can’t win ‘em all. The blade is approximately 7 inches in length with 2 inches of the blade on both sides being serrated before the final 1 inch connects with the handle/hilt. Hibben  (in my assessment) makes the best throwing knives. When you pick up throwing knives, you should pick up 2 sets of the same model: one to practice with, and the other for use when needed. In this manner, you’ll be able to sink that knife into a target from 15-20 feet away with no problem, and the quality/sharpness will not be a factor when you face a real-world situation. Your folder you want for a good all-around utility knife. For small cutting, just invest in a little folding pocketknife so as not to dull your blades continuously. Although 8” is the preferred minimum length for combat , do not underestimate what you can do with a smaller blade when the need arises. You want your knives to be maintained and as sharp as possible at all times. I don’t really wish to cover skinning and filleting knives, simply because there are so many on the market that you can use. I covered these because when push comes to shove, your combat blade can be used to skin game if need be. Just as all cooks in the Army can become infantry when needed. My preference is for the blade to be either black (subdued), or non-reflective/non-high sheen. My personal preference (although for some specialty blades such as my jumpmaster model you need a specialty sharpener) is the old-fashioned stone and oil method. It takes time, but it’s worth it. Other methods (non-specialty) put a “quick” edge on it that doesn’t last too long, but the honing stones  take a longer amount of time and deliver in the end.